FOMC keeps rates steady and pledges a “patient” approach to future rate hikes and balance sheet reduction. The Fed’s patience was telegraphed well in advance by a number of Fed officials in their individual appearances- and should have come of little surprise to the markets. However, markets reacted strongly to the removal of any reference to future rate hikes in the FOMC statement. 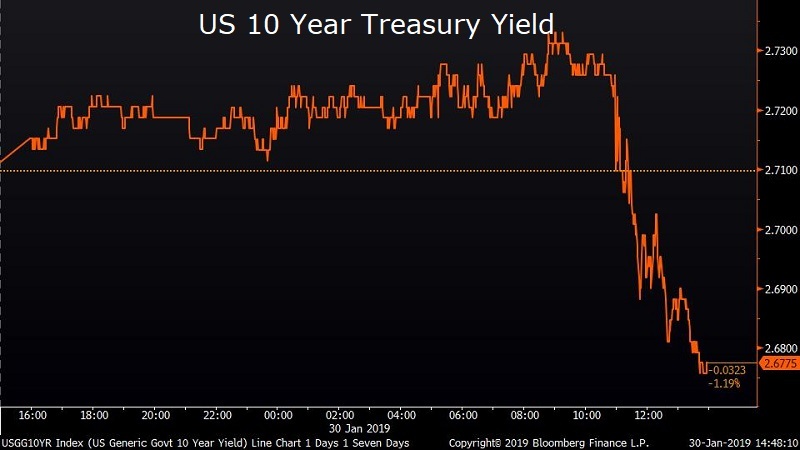 Treasurys rallied sharply off the back of the announcement and press conference with yields falling as much as 6 basis points on the short end of the curve. Fed Chairman Powell didn’t put a timeline on “patience” and was hesitant to characterize the pause as a new rate regime. A full comparison of the Fed’s December and January statements can be read here. Ten year Treasury yields closed at 2.685% on the day. Equities soar after FOMC announcement. The Dow Jones Industrial Average and the S&P 500 rose 1.77% and 1.55% respectively. 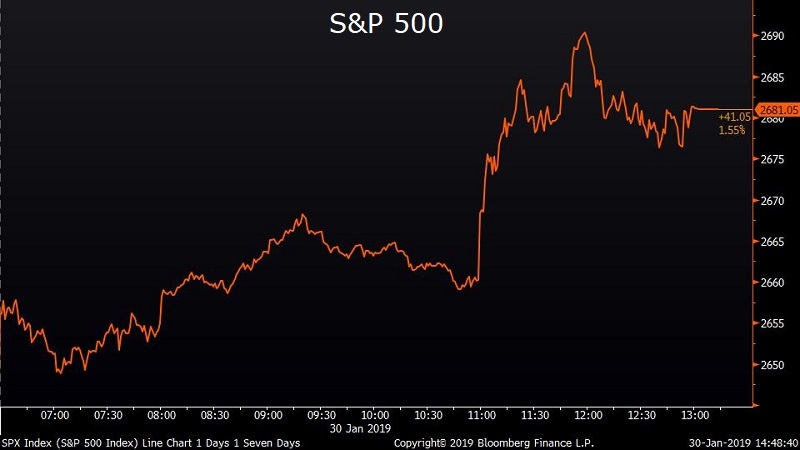 Trade volume was 15% higher than normal, 2.7 billion shares changing hands as markets digested the Fed’s rate decision and press conference. Powell’s press conferences have already been noted for their candor and frankness, a marked change from the more academic style of Fed Chairs Bernanke and Yellen. The Fed chief’s plain-spoken approach may come at a price, however, as today marked the latest in a string of volatile trading sessions on FOMC decision days. Brexit unlikely to have impact on US economy, according to Fed. Fed Chair Powell stated during his press conference that the Fed has been monitoring the Brexit situation “for a long time.” Powell added that the U.S. wouldn’t feel first order effects from a hard Brexit, and that he doubts the impact would be significant to the U.S. economy. While the risk of financial contagion to the US is low, the risks to Europe may be significant after a streak of disappointing economic data. 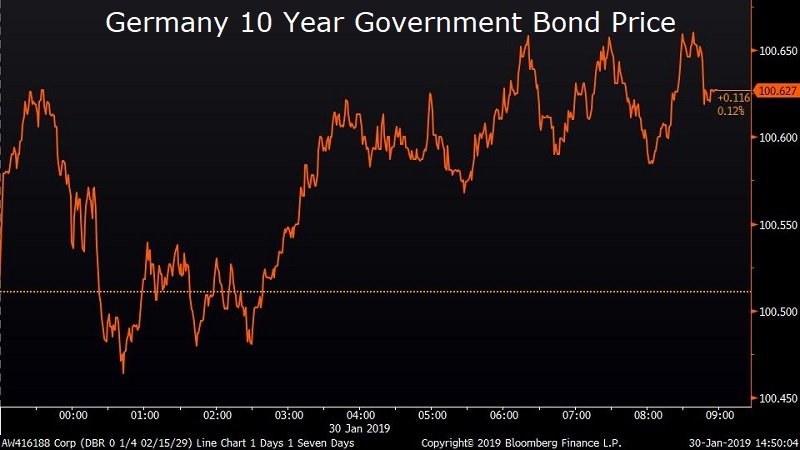 The German government has downgraded its 2019 growth forecast to 1% from 1.8% and the ECB itself has acknowledged the softening prospects for the economy, saying “risks have moved to the downside”.